Successfully Added USB 2.0 SIM Card and SD/MMC Memory Card Reader to your Shopping Cart. Multiple USB memory card reader that makes life more simpler. Why have your work desk cluttered with several individual card readers, when you can simply have one multiple card reader that does the same job as 5 card readers. This multiple SD/MMC, micro SD/MMC and SIM card reader comes in a fashionable designed black casing with a see through protective slide casing. This is the simplest, fasted and most convenient way of transferring data, music and video files from one card format to another using your laptop or desktop computer. further more, back up all your SIM card contacts and contents with this compact form factor USB device that fits easily in your pocket, meaning it is always at your side when you need it. 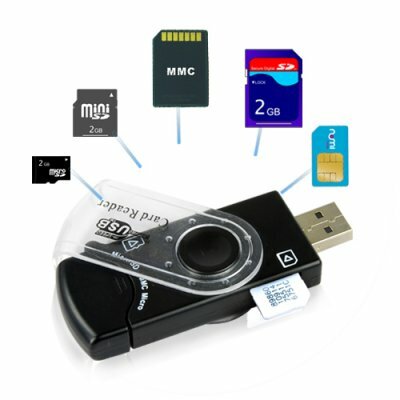 This USB memory card reader comes with 3 slots, two of which support SD/MM and micro SD/MMC. In addition, there is a 3rd SIM card slot on the side of the USB 2.0 card reader for cellphone SIM cards. This model is great for users utilizing a variety of flash card formats to transfer photos, music, video and work data from their computer, digital cameras and other types of digital devices. This card reader is extremely user-friendly and easy to use. Effortless installation with plug and play functionality and no need to restart the computer. The CVHR-G46 would be ideal for portable use on the road, or at home with a desktop or laptop computer. As always, this multiple USB card reader is available to you straight from the leader in direct wholesale electronics, Chinavasion. Powered by USB connection, no external power required. The fastest and easiest way to transfer images, music, and data to and from your computer. - USB 1.1: 12 Mbits/sec. - USB 2.0: 480 Mbits/sec. System Requirement: Windows 98SE/ME/2000/XP (No installation required for Win SE and later versions. on 2009-08-18 08:45:35 love it ,easy to use and always have with you.